I’m so proud of what we have achieved! Going past the dis-used building every day for the last couple of years has been really sad and frustrating, knowing it’s a real asset and has so much potential. Angie Wright, CEO at B Inspired, shares with us her experience of taking the Braunstone Grove Building in Leicester into community hands through community asset transfer (CAT). Braunstone is home for me. It’s a part of Leicester that means a great deal to me and my family, who have lived in area since the 1970s. As a family we found ourselves in difficult circumstances when we first arrived – times were tough! But, from day one we were struck by the level of neighbourliness and community-spirit there. People really did look out for each other and help where they could. Despite the sad state of decline inflicted on the area during the Thatcher years and early 90s when unemployment became the norm, the resilience of the Braunstone people continued to shine through. There’s an inextinguishable spirit of ‘getting things done’, which never fails to inspire me. 15 year ago I was lucky enough to return to Braunstone to work on the regeneration of the area through B Inspired – a business trading for the benefit of the local community. We deliver a range of much-needed services for local people: sport and physical activity programmes, employment support services, a Befriending scheme tackling social isolation, a food bank and charity shop, community events, environmental work and food growing projects. Our main trading activity is asset ownership and management. We use the profit from these ventures – which include a managed workspace facility and a health and social care centre – to invest money back into the community. 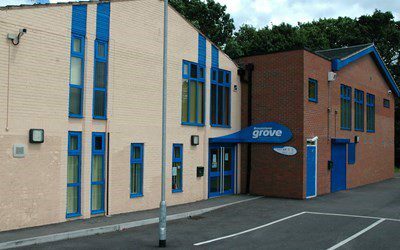 Most recently, we acquired Braunstone Grove – a Council-owned community facility with five adjoining football pitches – through a process of CAT. Doing so was the culmination of a three-year process which had many ups and downs along the way. When the building was first offered up for CAT by the City Council, we had no viable business case to take it over. But, as our apprenticeship and sport programmes grew, we found ourselves with limited facilities to deliver them. Community consultation revealed a real desire by local people to have lots more activities for young people and the returned use of the five football pitches attached to the Grove. So, armed with a clear demand expressed by the community, we set about creating a business plan. Our plans were met with overwhelming support from local people and groups, and we chased the council to re-tender the CAT for the Grove. Many long months of waiting for the Council to prepare the tender allowed frustration to set in. But our chasing paid off and the tender was release in early April this year, with a 6 week turnaround time! With a lot of support through the Empowering places capacity support programmes from Power to Change and Locality, we made our bid in May and after months of being on “tender hooks” were told we were successful in August! We are now into negotiations on the lease with the Council about what we are prepared to accept in terms of repairs, as the building has become prey to routine vandalism over the year given its dis-use. We’re also in discussion about the practical handover process, but fortunately Leicester City Council are well versed in this process. They have been undertaking CATs for around five years now under their ‘Transforming Neighbourhood Services’ programme, primarily in response to budget cuts. I’m so proud of what we have achieved! Going past the dis-used building every day for the last couple of years has been really sad and frustrating, knowing it’s a real asset and has so much potential. It means that the vision we have to nurture a real community hub for community business, where local people get a chance to try out their ideas, is possible.